Recently, I’ve been working on a project where the reference data is stored in SharePoint lists. While it is possible to get the information out of the SQL Server database directly, using something like the T-SQL below, it’s a bit messy. I wasn’t able to use this to get the data out, as the client doesn’t allow direct access to the SharePoint database, which is entirely reasonable, given that it’s their corporate intranet. 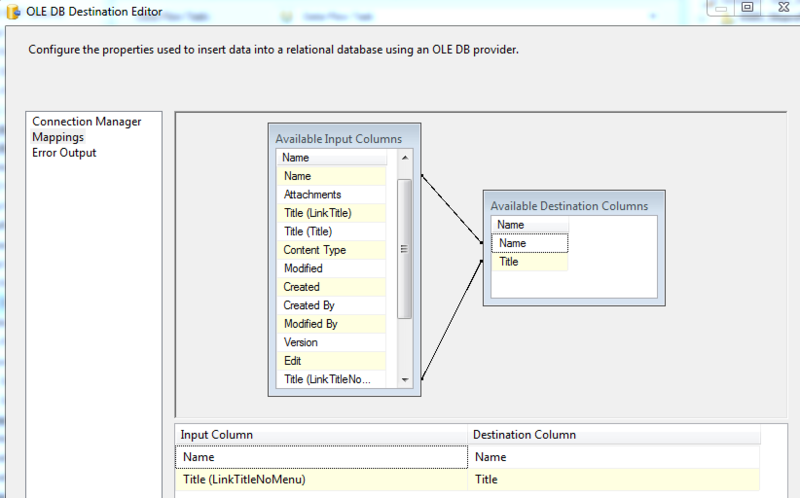 To get around this, I found a very useful set of additional modules for Integration Services (http://sqlsrvintegrationsrv.codeplex.com/), one of which is a SharePoint List Source and Destination. These then allow you to read the data directly. 1. 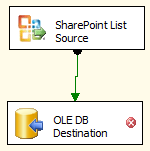 The first step is to download the SharePoint List Source and Destination module from http://sqlsrvintegrationsrv.codeplex.com/, and install it. 2. 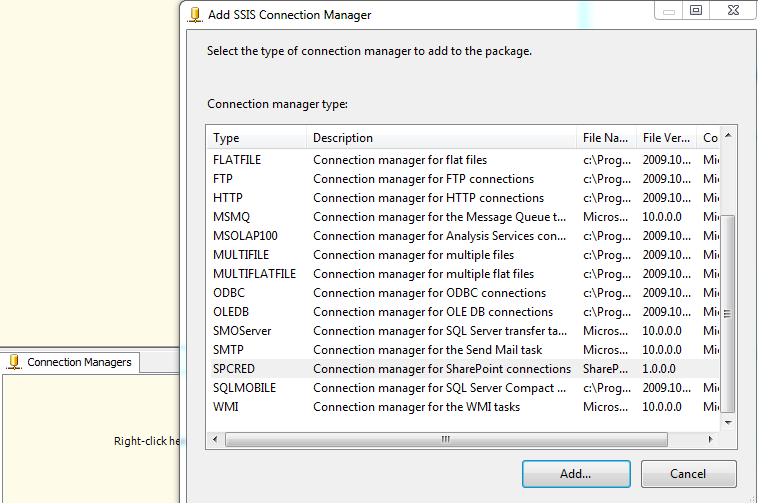 Having done that, you need to start up BIDS (BI Development Studio / VS 2008) and create an ‘Integration Services Package’. 4. 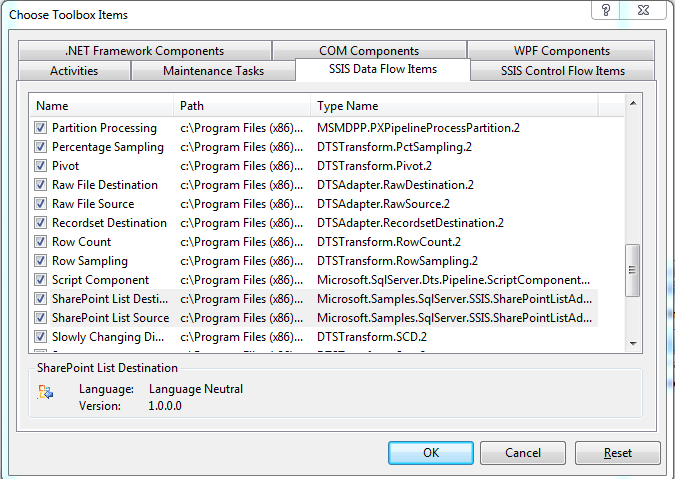 Add a Dataflow Task to the Control Flow in the SSIS Package. 5. Right click on the Connection Manager Section at the bottom of the Control Flow, and choose SPCRED (Connection Manager for SharePoint Connections). Click OK, when the Dialog for the SharePoint Connection opens. 7. Right click on the List Source, choose Show Advanced Editor. In the Connection Managers tab, pick the SharePoint Connection you created in step 5. 8. Next, click on the Component Properties tab. In this tab, you need to specify the Name of your SharePoint list (SiteListName) and the URL of your SharePoint server (SiteUrl). The SiteUrl is the Parent site within which your List appears. If you want to filter the information from SharePoint, you can modify the CamlQuery section in here, and add a SharePoint CAML query. 9. Once you’ve populated this, click on Refresh, and if everything is working, you’ll be able to move to the next tab. If there are errors (such as an incorrect SiteUrl), you’ll get errors like the one below. 10. Moving on to the Column Mappings tab, then gives you a list of fields and mappings, representing the Available fields from SharePoint (on the left) and fields that will be available to pass out of the List Source (on the right). You can remove fields that are not relevant here, if you’d like, then click Ok, to return to the Data Flow. 11. We need to add an OLE DB Connection manager, by right clicking Connection Managers at the bottom, and choosing ‘New OLE DB Connection’. 12. 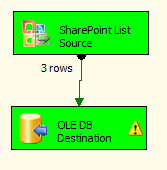 To get the SharePoint list contents into a database table, we need to add an OLE DB Destination, so drag that into the Data Flow and hook the Green output from the SharePoint List Source to the top of the OLE DB Destination. You’ll then see that there is a red X on the OLE DB Destination, so we need to make some changes. 13. Since we need to make changes to the OLE DB Destination, double click on the OLE DB Destination. 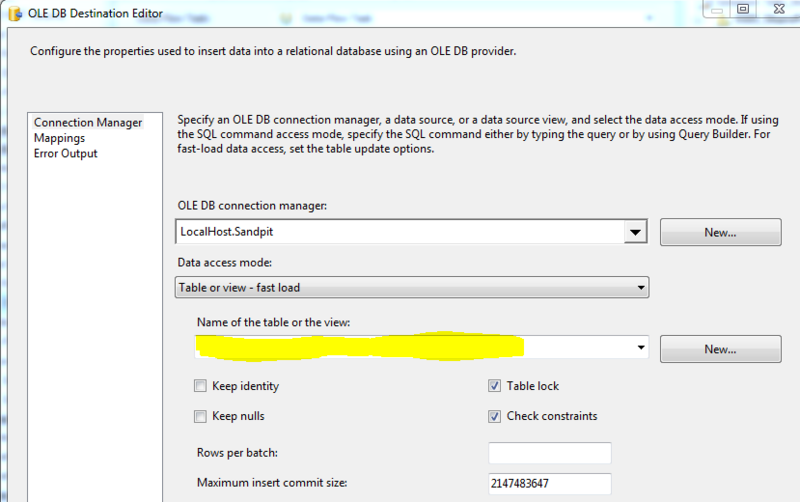 As shown below, we need to specify a table for the SharePoint data to go to. The drop down list has a list of the tables in the database connected to the OLE DB Connection Manager, so pick a table (if you’ve made one already) or click new to create a new table. 14. Then click ‘Mappings’ on the left, and it’s possible to link the field in the source (SharePoint List) to your destination table. 15. You’ll then be able to run this SSIS Package, and assuming all is running successfully, you’ll see green boxes. NOTE: Any text fields that are stored in SharePoint Lists, are stored as Unicode strings in the database (so nvarchar). Further documentation on using these adapters is available here. I attended the Webdd09 conference at Microsoft Reading on Saturday (yes, a Saturday…). Was a really interesting group of sessions, covering the new features coming in Visual Studio 2010, ASP.NET 4 and Silverlight 3. It also covered some of the features of IIS 7, which has been out for a while now. without you having to change anything on your website. This is a good thing as Search Engines, such as Google (84 % of the Market share) index pages based on the URL. This is a good thing to know as Google have stopped taking into account embedded keywords on websites (the meta tags). In fact, the only meta tag they are now taking account of is the Description one. Useful stuff to know. 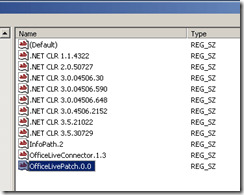 Recently, Windows Update included a set of addins, including Office Live connector. This then causes error messages when customising SharePoint. 5. Then restart Internet Explorer (including all instances). You will also need to set custom errors to ‘Off’ . Do you sometimes get an ‘Access is Denied’ message when deploying a custom web part from Visual Studio, to SharePoint ? If so, you can resolve this by stopping and restarting the Indexing service. 1. Go to a command prompt. 4. Try deploying your project again. Ok, this is complicated to explain. Say, for example, that you want to have a link on a website, that a user can click on, to gain access to their Home Directory (which is retrieved from the Active Directory field). Ok, kind of a specific need, I know. 2. Create a website in IIS, ensure that authentication is Windows Integrated, and not Anonymous. 3. 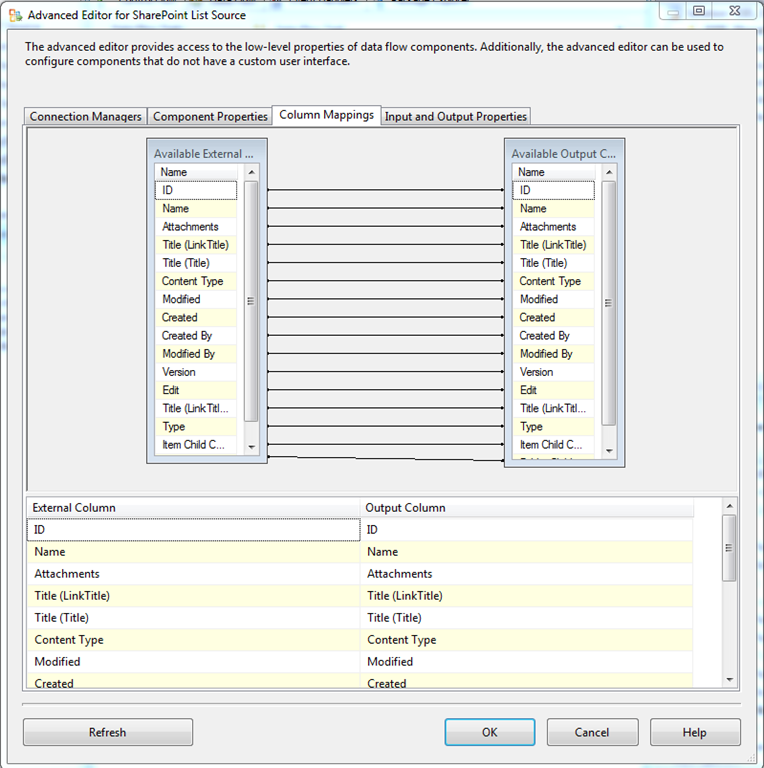 Create an ASPX page, and give it a FormView (or data enabled tool). This query will return the home directory, from ADSI Linked Server, for the current user. We’ve been suffering from an intermittent issue with our Microsoft Office SharePoint Server (MOSS) over the past month or so. We get a message saying “the path specified cannot be used at this time” when going to the Internet Information Services (IIS) Manager section within Computer Management. This has also caused problems when trying to deploy a workflow to the MOSS Server. This can be resolved by restarting the Windows SharePoint Services Timer service. This then allows you to reconnect to the IIS Manager. Hooray! Having found a really useful entry on the SharePoint User Group website, it says that a hotfix is now available from Microsoft to resolve this issue once and for all! A great article covering creating a custom workflow to do a Holiday Approval process. From time to time I hear from SharePoint users that they always have to wait for their developers if they want to have a workflow that is not available ‘Out Of The Box’. As a respond I ask them which workflow they want to use or have and apparently most of the workflows can be created in SharePoint Designer without writing one line of code. In this article I’m going to create a ‘Content Approval’ lookalike workflow, named the ‘Holiday Request Approval’ workflow (Human Resource managers can thank me later :-)). Before we open up SharePoint designer, we need a ‘Task’ list and a ‘Holiday Requests’ list, which is based on the ‘Custom List’ template. So the easiest way is to create a site based on a ‘Team Site’ and add a custom list. In the ‘Holiday Request’ list we create some holiday related columns, such as ‘start date’ and ‘end date’. The cool thing about creating Workflows in SharePoint Designer is, that it’s nothing more than running through a wizard and that you can create pretty nice Workflows without writing a line of code. In this step we need to provide a title for the Workflow, in our case it is ‘Holiday Request Approval‘. Next you need to specify on which list or library you want to use it and when you want to start the workflow. When an employee adds a request for a holiday, we need to create a task for the Human Resource manager who needs to approve or reject the request. So we need to create a kind of special form where the manager can select his choice. 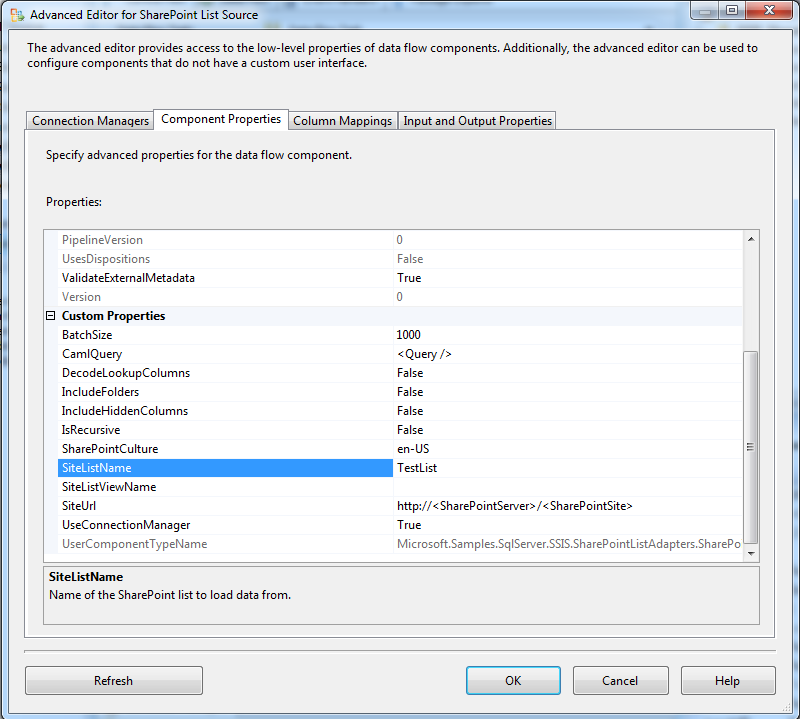 Because I don’t want to write one line of code I’m going to let SharePoint Designer create the form. Can the employee go on holiday or not? Click on the add button to add these two questions on the page. Once you’ve added these two fields click on the Finish button to complete the data part of the action. What we’ve actually done is, we’ve created a task for the human resource manager (me) to approve or reject the holiday. Because we want to use the outcome of this task we need to save the ID of the task that we’ve created. This is is the variable that we want to collect. Once we’ve completed the first action we need to save the respond of the human resource manager. With respond I mean, what is the status and what is the comment that the manager gave. To save these responds we need to create 2 variables and store the responds in these variables. Find the Action ‘Set Workflow variable’. If you don’t find it click on ‘More Actions…’. What do we want to collect? Well we want to collect the things that the human resource manager provided in the task that we’ve created earlier. How do we know which Task that was, because there could be more than 1 task? Remember that we’ve saved the ID of the task in a variable, see ‘Variable to collect’. So in the Source drop down box pick ‘Tasks’ as the selected source. Once you’ve selected the task list, you have to look for the ‘Holiday Request Approve Status‘ field which we’ve created earlier. In this field you find the answer of the first question. Because there could be multiple tasks in that list you need to tell which task you would like to use. Get the task with the ID that you saved before. this ID is saved in the ‘HolidayRequestTaskID’ variable which you can load by using the ‘fx’ button and choose for Workflow Data. Once you’ve setup all the fields click OK and do the same for the comments question. Next we are going to create a new Workflow step. You can do this by clicking on the ‘Add workflow step’ link on the right side of your screen. Once this is done, click OK. Normally you will do an action if it is not approved. Finish the creation of the Workflow and add a new item in your list, if everything went right you should have a new task created for the human resource manager that you’ve selected. So, I’ve hope that I could show how you can create some more advanced workflows in SharePoint Designer. This web part solution is great, and even works in MOSS 2007 interestingly, but my customer on this project was looking for an even easier solution that did not involve having to manually touch each document library at some point. After some further searching I found the steps to modify site definition files to change the inherit behavior of document libraries so that each time one is created it will automatically have this “new window opening” behavior. Andrew Connell had a great blog post on this. All of this info was helpful, however the problem of course is that the site definition structure in MOSS 2007 is quite different from SPS 2003 and so the steps to make these granular modifications have changed. After some tinkering around I finally figured it out (or so it seems, the behavior seems expected so far, no weirdness has yet emerged!). Apparently there is now a “global” folder for site definition files, I am still trying to understand the mapping of things from SPS 2003 and MOSS 2007. A useful blog post for changing the SharePoint Links list to open links in a new window. I was recently looking for the easiest way to modify the links list in SharePoint 2007 to open the links in a new window. In my case, every link in a links list points to an external site, so they should all be opening a new browser window. There were a couple custom features I found, but most required modifying (or replacing) the existing links lists, something that I did not want to do. Anyway, here’s how to make the change (note: I modified the original files, this probably isn’t a best practice, and the changes could be lost by updates from Microsoft). Then restart IIS (or just the application’s worker process), and now all the links in your links lists should open a new browser window!